April 11, 2017, Taipei– Acrosser Technology Co., Ltd. (Acrosser) proudly announces its first new product in 2017, the ANR-C236N1, a powerful 1U rackmount server with unique Dual-Protection feature which allows simultaneously supporting both hot swappable HDD/SSD and the highly-effective redundant power supply. This Dual-Protection can eliminate unnecessary failures, reduce the chance of system errors, and improve server efficiency, as well as the IT staff efficiency. Whether it is the web server, mail server, UTM or any other network application platform, stability and reliability are absolutely the first 2 priority considerations for buyers. Even for a short period, mechanical failure will cause great loss in business. To meet these needs, the new and powerful Acrosser ANR-C236N1 series server comes with its unique Dual-Protection feature which protects your server/network to run safety 24/7. The ANR-C236N1 is equipped with a hot-swappable HDD/SSD for RAID 0/1 which allows your IT staff to remove the malfunctioning HDD/SDD without shutting down the machine, thereby eliminating machine downtime. The other feature of Dual-Protection is the ANR-C236 is also equipped with 1+1 redundant power supply units (RPSU) which avoids the unexpected power failure and increase the power supply product life by balancing the power output. In addition to the Acrosser unique Dual-Protection, this brand new rackmount server comes with the latest Intel® server chipset C236 PCH, which supports the latest Intel® Xeon® E3-1200 V5 server processor, and the 6th generation CPU Skylake-S Core i7/i5/i3/Pentium series. Moreover, the ANR-C236N1 designed for Skylake-S is forward compatible with Intel® 7th generation CPUKabylake. In addition, the ANR-C236N1 series provides a more flexible server platform & system expansion versatility with 12x GbE copper LANs (4-pair bypass), 2x 10G fiber networks (SFP+) , 1 x expandable network interface modules (Exp. NIM), 1 Console, 2x USB 3.0, 2 x USB 2.0, 1x HDMI and 1 x Exp. PCIe slot. Furthermore, ANR-C236N1 series is equipped with an LCM display which shows 100 x 16 Pixels in Graphic Mode and 16-character x 2-line in Character Mode. In the power system, a set of 1+1 redundant power supply units (RPSU) come with AC-IN (100~ 240V) , enabling reliable options for system recovery. The ANR-C236N1 power system comes with a special Smart Fan System which increases or decreases fan speed to develop efficient and cost-effective power systems. Acrosser had committed its valuable resources to further develop its advanced network product lines. 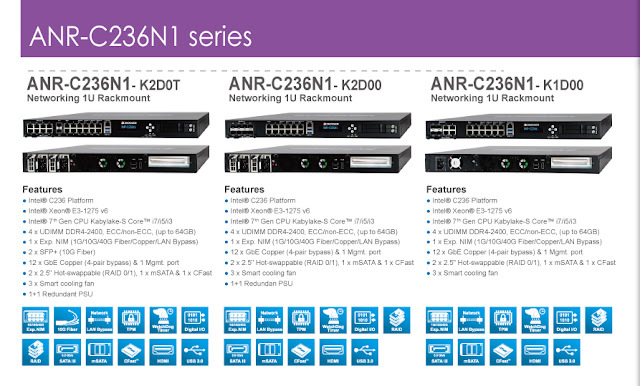 Because of these efforts, the ANR-C236N1 had developed as a perfect service/network machine for most business networking applications. Acrosser Technology not only provides products with high reliability and availability, but also networking appliances and products with the best scalability and manageability in the industry. Acrosser Technology is your best choice for building servers and workstations in today’s workplace. For more product information, or asking the price of this brand new product, please receive a product quote RIGHT NOW! Acrosser, is 100% committed to providing its OEM/ ODM/ JDM and end-user clientele with high-quality innovative embedded computer solutions and networking appliances for shorter time-to-market and in achieving higher competence to win business opportunities in the market place. Subscribe to our social media sites and stay connected! 前 上一篇文章： Feature to its new In-Vehicle PC product to not only simplify the deployment process but also enhance the communication quality.